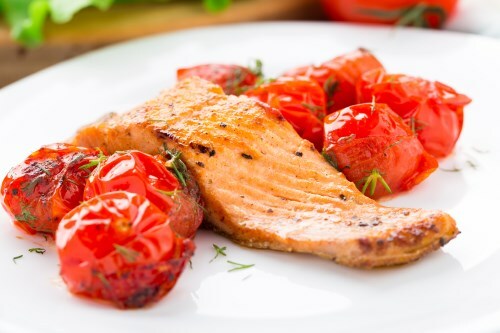 Brush each salmon fillet on all sides with extra virgin coconut oil and arrange into the bottom of a glass baking dish with the skin side facing down. Scatter the tomatoes, feta cheese, onion, basil, and olives over the fillets; sprinkle with the lemon juice. Bake in the preheated oven until the salmon flakes easily with a fork, about 20 minutes.